Kids’ fairytales always make for interesting slots (even if the kids won’t be getting in a thousand miles of your online casino account) and it’s no wonder – children’s stories lend themselves to interesting characters, lots of color, and the potential for some nice bonus rounds. 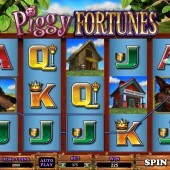 Renowned slot developer Microgaming’s Piggy Fortunes is a worthy addition to the pile, and if you’ve played Leander Games' luscious fairytale-inspired Little Pigs Strike Back game or Microgaming’s nursery rhyme-themed Rhyming Reels Georgie Porgie, you’ll probably get a kick out of this. There are a lot of other online slots out there with fairytale or nursery rhyme themes but some can miss the mark a bit. However, Piggy Fortunes appears to be one of those that delivers. Played out over 5 reels and 25 fixed pay-lines (making this game a little higher variance than normal) Piggy Fortunes is all about the classic tale of the Three Little Pigs. The titular piggies are present and correct on the reels, as are their houses – the straw house, the wooden house and the brick house. Elsewhere, filling up the reels, are the 10-through-Ace symbols and, of course, the big, bad wolf, ready to huff, puff, and blow those houses down. Winning combos animate quite nicely and there’s some gentle music playing in the background (although after about a minute I found myself slamming the Mute button). That wolf acts as the game’s Wild, substituting for all regular symbols other than the Scatter. Annoyingly there’s no jackpot for multiple Wilds on the reels, but it does play a part in the game’s one bonus feature. The Three Little Pigs symbol is the Scatter, and three or more across the reels triggers the Big Bad Wolf bonus feature. The reels will spin in the bonus game, and if the Wolf symbol appears adjacent to one of the piggies’ houses, he blows down all houses of that type on the reels. The straw house gives a 2x multiplier, the wood house gives a 3x multiplier and the brick house a 4x multiplier. Furthermore, three or more Three Little Pigs Scatters appearing again will then rebuild houses that have been blown down. Think of it like re-triggering spins. 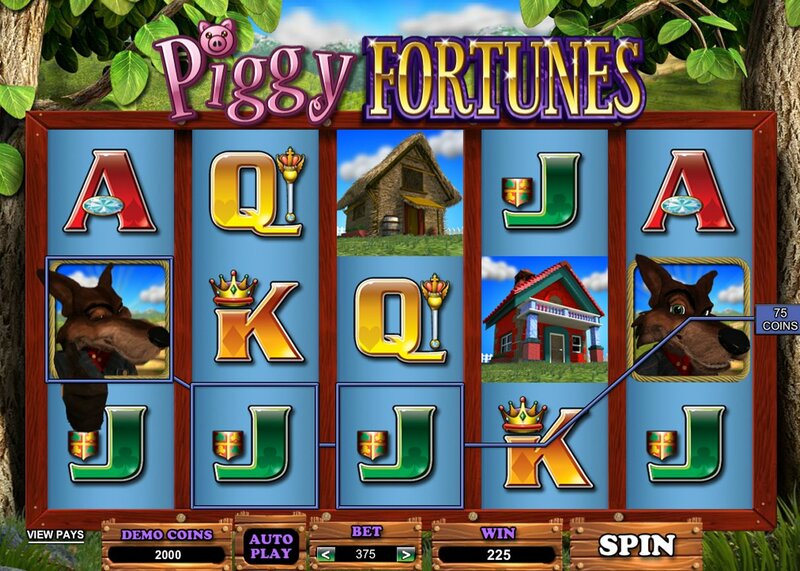 While there are some big bets going on in this game Piggy Fortunes still caters to all wallets. An interesting bonus round just about saves it from the hum-drum, but overall this is solid Microgaming fare. The theme is one that will strike a chord with any child that loved the Three Little Pigs story and that can be more than enough to keep players hooked.